THE amazing Kuomboka traditional ceremony of the Lozi people in Western Province is back! The traditional ceremony is an interesting annual cultural spectacle that will be commemorated tomorrow. The ceremony is displayed in a spectacular procession which has been missing from the national calendar since 2013. People in their hundreds, if not thousands, are expected to descend on Mongu for tomorrow’s spectacle which promises to be the biggest, partly because this year, the Litunga’s royal barge, the Nalikwanda, will be powered by a 180 strong team of paddlers unlike in previous years where only a maximum of 120 paddlers have been assembled for the task. •IN the morning, the mutango, the first and oldest royal drum, is played at Limbetelo, sending a message that the Litunga of Barotseland is set for the journey to Limulunga. The Nalikwanda holds the record of being the largest waterborne vessel that is powered by hand in contemporary times. 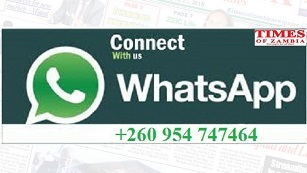 Announcing this tomorrow’s proceedings recently, Barotse Royal Establishment (BRE) acting Ngambela (Prime Minister) Induna Mukulwakashiko said this year’s Kuomboka ceremony will take place with the biggest Nalikwanda. He said the Kuomboka ceremony has been the pinnacle of the Barotse Kingdom in terms of marketing its rich and diverse cultural heritage. Mongu District Commissioner Susiku Kamona declared Western province ready for the Kuomboka ceremony tomorrow. He said everything is in place and the whole of the Western Province is more than ready to host the prestigious ceremony. “We are ready and exited for the Kuomboka ceremony,” he said. He described the atmosphere in Mongu as good, peaceful and highly charged with excitement as people from all walks wait for sunrise tomorrow. Mr Kamona explained that the water levels on the Baroste Fool Plain are high and perfect for this year’s Kuomboka ceremony. Those watching the ceremony this year will have a better view of proceedings because of the Mongu-Kalabo road which will facilitate easy movement. He said President Edgar Lungu is expected to grace the traditional ceremony. Each year in Zambia’s Western Province, the Lozi speaking people, who are also called Malozi, who inhabit the Zambezi Flood Plain, move to the highland when the Zambezi River floods its plains towards around the month of April. The people are led by the Litunga – the king of the Malozi in this symbolic ceremony known as the Kuomboka, which means ‘getting out of water’. This ancient ceremony celebrates the Litunga’s move from his summer home at Lealui in the flooded villages of the Barotse Flood Plain, to his winter home in Limulunga on the higher ground, where he remains until the water subsides in the plains around June or July. The festival is celebrated each year at the end of the rainy season, around March or April when the upper Zambezi River floods the plains of Western Province. The Litunga decides the date for the ceremony a few weeks beforehand after considering the level of the floods, the availability of food and the phase of the moon. The Litunga is accompanied on the journey by his prime minister and other local area chiefs known as the indunas. The Litunga’s boat is named “Nalikwanda” and is large enough to carry his possessions, his attendants, his musicians and the paddlers. 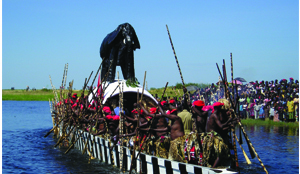 The boat is decorated by a large statue of an elephant, which is a symbol of authority of power to the Lozi. The boat or barge is painted with black and white stripes. It is considered a great honour to be one of the paddlers. The ceremony begins with two white scout canoes that are sent to check the depth of the water and for the presence of any enemy. Once the scouts give the all-clear signal, the journey to the highland begins. The Litunga’s royal boat is followed by another boat for his wife and another for the prime minister. The journey to Limulunga normally takes about six to eight hours. Drums beat throughout the journey to coordinate and energise those paddling the boat. The Litunga begins the day in traditional dress, but during the journey, he changes into the full uniform of a British admiral that was presented to him in 1902 by King Edward VII, in recognition of treaties signed between the Lozi people and Queen Victoria on England. Every year, the Barotse plains are inundated by the floods which spread across villages and pasture lands, compelling all inhabitants to move to the margins of the plains and the hilly areas of the forest. But for the last three years, the Koumboka ceremony had not been celebrated due to low water levels on in the plains as a result of low rainfall. Days before the day of the Kuomboka ceremony, royal drums called the maoma, are beaten at Lealui to summon paddlers. This is a special occasion as the maoma are first beaten by the King – the Litunga – a position being currently held by Lubosi Imwiko II (Mbumu wa Maoma). After the Litunga, the drums are later beaten by members of the royal family, led by the Natamoyo (chief justice), indunas, and the general public take turns to sound the royal drums. The maoma are beaten non-stop from morning until 23:00 hours in the evening. It is said that on a quiet night, the sound of the royal drums can be heard up to 15 kilometres away. When the drums are sounded, hundreds of people descend on Lealui, including paddlers from various parts of Barotseland. The royal canoeing regatta takes place as well, where the competition is flagged off by the Litunga. On the actual day of the Kuomboka, in the morning, the mutango, the first and oldest royal drum, is played at Limbetelo, sending a message that the Litunga of Barotseland is set for the journey to Limulunga. At Mongu harbour, people gather to travel by various boats to Lealui through the flooded Barotse plain. At approximately 09:30 hours, the Litunga, dressed in traditional Silozi kilt (sikutingo), leaves his palace and, in keeping in tune with the royal drums, walks majestically to Lealui’s Nayuma Harbour. Eulogists, the praise chanters, with very strong voices, take turns in praising the Litunga. The Litunga boards the Nalikwanda Royal Barge, which will have 180 paddlers. The Nalikwanda sets off, followed by the Notila, Matende, Mbolyanga, Sabelele, Nalikena (for the Ngambela) and hundreds of small boats and canoes. At 16:00 hours, the spy boats Natamikwa and Mundende arrive before Nalikwanda docks at Limulunga Harbour where the Litunga is received by thousands of people. A display of Manjabila, Lishoma, and Maoma, are played before the Nalikwanda docks. Men perform the Silozi royal salute – kushowelela – while the women dance and sing limeka and liimba. The Litunga emerges from the Nalikwanda immaculately dressed in his royal admiral ceremonial suit in tune with royal drums. He walks majestically – Kutamboka – to the royal pavilion known as Lutatai. Paddlers, like warriors, dance to Lishoma and then perform the Silozi royal salute. At 21:00 hours, the royal drums are beaten to announce that the Litunga is now in the winter capital, “Limulunga lya mulonga lya mambo kupula”. After the Koumboka, at 05:00 hours the following morning, the royal drums are beaten following the same procedure until 07:00 hours. The maoma royal drums will not be sounded again until Kufuluhela ceremony which is celebrated when the Litunga returns to Lealui. This is followed by Silozi royal salute, kushowelela, by the Ngambela or prime minister, indunas, and paddlers. A variety of traditional songs and dances are performed. The Ngommalume royal dance performed at the palace square, which is known as Namoo, is the major activity of the day after the sounding of the maoma. Ngomalume means men’s dance. It is a warrior’s dance after a victorious conquest. Men wear animal skins (lipatelo), or traditional kilts (liziba) and red berets (mashushu). These skilful dancers entertain the Litunga and thousands of visitors, tourists, and the general public. Ngomalume ends with Nalikanda and Lishoma dances. In the evening, women prepare for liwale dance, kushunela liwale in the palace yard. Liwale royal dance is the major dance of the day. It is performed by women led by princesses. All women wear flamboyant traditional Silozi dress known as musisi. They dance to the rhythm of the royal drums without a song. This dance ends with the Silenga and Lishoma dances. The major traditional dances are siyemboka and lilombola, performed by the subjects of both Mwene Chiyengele and Mwene Kandala of Nanoko and Mabumbu respectively. These are performed before the Litunga. In support of this ceremony that displays the benefit of culture diversity, Ministry of Tourism and Arts Cultural Director Victor Makashi said traditional ceremonies should be used as an avenue for promoting unity in diversity. Mr Makashi said traditional ceremonies are key in helping to reduce conflict among people. “As Zambians, we should be proud of our culture and take time in learning different cultures in order to be able to understand each other,” he said. He explained that Government supports traditional ceremonies because they preserve and promote Zambian culture. He said the traditional ceremonies are also a tool to bring foreign exchange in the country, besides promoting handcrafts. He said owing to the large number of foreigners who attend such events, the traditional ceremonies have become platforms of interaction for local people, tourists and market the country internationally. The Kuomboka ceremony remains an integral part of Zambia’s rich cultural heritage and should be preserved for the good of future generations. It is an exceptional way of recollecting history and keeping the cherished traditional values for the benefit of both the present and the future generations.